I really wish I knew about The Nursie pillow when my daughter was still a newborn. This was exactly what I’ve been looking for! When I was pregnant, I bought a cute elephant-shaped nursing pillow which a friend of mine recommended. I thought it was good at first because I can lay my baby down. But for some reason, I can’t seem to get it in the right position while I was sitting in my nursing chair. It just felt quite uncomfortable. And after frequent use and frequent washing, I noticed that it lost its original firm shape. Needless to say, I was quite unhappy with it. I also wished I had a nursing pillow that I can easily fit in my nappy bag so its easier to breastfeed on the go. 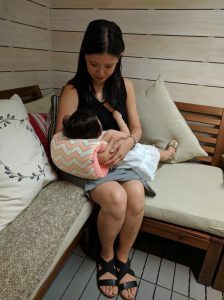 On the other hand, The Nursie pillow is so soft and plush, you can feed at the right angle, and it offers excellent support! I loved using it from the time I first received it in the mail! I love products created by fellow breastfeeding moms! Tiffany Meinhart had a back injury which wasn’t much help in making her breastfeeding journey more comfortable. Since there’s not much viable options in the market, she created a pillow, The Nursie, that would provide support and relieve the pain. It’s wonderful how The Nursie easily slides over your arm! It also allows you to maintain better posture and helps reduce gas and reflux for baby. It is even way better than a regular pillow! Especially if you have a newborn, you will need proper support since you will be feeding at an average of 8-12 times in 24 hours, for about 40 minutes each session. To me, a nursing pillow is an essential part in making your breastfeeding journey more comfortable and relaxed. I knew that I will be nursing for an extended period of time, so comfort is of utmost importance. The Nursie pillow easily slides on and provides great arm support. The cotton filling offers enough support to help keep younger babies straighter for feeding and older babies at the right level. It also doesn’t put any strain on my arm because of the padding! It comes in one piece and there are no velcro, snaps, or zippers to worry about so you can feed your baby right away. There are no storage pockets, but I don’t think that’s necessary. The size is just right and its compact enough to bring around. It’s so easy to use anywhere even when you’re travelling. The Nursie pillow makes for a great companion on road trips or when you’re travelling on a plane especially for a long flight. Based on my experience, the pillow they usually provide in-flight aren’t really that comfortable nor firm enough, and it keeps slipping out of its position when you and your baby keep moving around. While it also makes for a great pillow for older children, for newborns and small children – it is strongly advised that you do not use it for anything else other than breastfeeding or bottle-feeding. 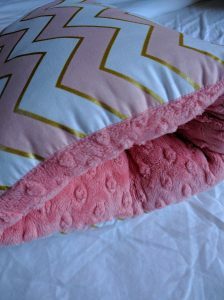 It is handmade, made of 100% cotton, and it feels so soft and luxurious to the touch! Even after repeated washing, it held its shape. Love that it did not flatten, nor did it become lumpy! Tried it during summer, and it felt quite warm in the arms in very hot weather. There are also so many designs to choose from. I had a hard time choosing since I loved so many designs! In the end, I chose Blushing Glitz since I love pink and gold. Since it’s so handy and simple to use, I know that some moms even get two – one for the car, and one that they can use at home. I think it also makes for a great gift! To me, it’s very important for a nursing pillow to be easy to clean. Let’s be honest, sometimes we can’t help but spill a drink, or have bits and pieces of food there, or maybe even a bit of vomit, dribble, and poo as well. So since we use it oh so often over an extended period, it NEEDS to be washed easily. You don’t even have to worry about washing the cover and pillow separately like other nursing pillows. Since it comes in one piece, just pop it in the washing machine. I am so happy that it can be machine washed cold and you can either lay it out to dry or tumble dry on low! How easy is that? 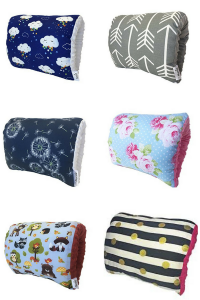 In Conclusion, The Nursie Pillow is simple to use, handy, and a convenient nursing pillow that you can use frequently over an extended period of time. I highly recommend that you get your own, as it is a must-have that you should not miss out on. Your back and shoulders will thank you for it! Use promo code “BFM15OFF” at checkout from Amazon to get 15% off your order of The Nursie. I hope you enjoyed this review and if you have any questions about The Nursie Pillow or want to leave your own personal review, leave a comment below. This entry was posted in Breastfeeding Clothes and Accessories, Product Reviews and tagged thenursie, thenursiepillow, thenursiepillowreview, thenursiesliponarmpillow. Oh my goodness I love this pillow! I wish I’d seen it sooner in my breastfeeding journey too! 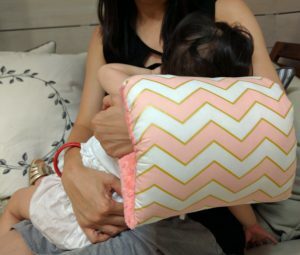 I’ve worked my way through several breastfeeding pillows, from ones that clip round your waist to others that just sit there (and slide around) but this looks so easy to use! Can it be used in other breastfeeding positions aside from the cradle hold? Yes, it’s really comfortable and easy to use! I just love this pillow! You can use it in other breastfeeding positions which is wonderful! I definitely recommend this. I nursed my 5 boys and never had anything so wonderful as this pillow! This looks like a great invention, so handy and helpful. I wondered while I read though, if the pillow would be too big to use with a newborn? 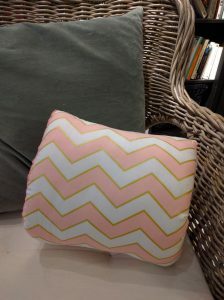 You are right about the amount of time you would spend nursing a brand new baby, and that the support would be great, but I can’t tell from the pictures if this pillow would be the right size or not? Thanks Elisa! It’s really a great pillow that you can use anywhere. It’s safe to use even for newborns (as long as it is only used for breastfeeding or bottle feeding both for newborns and small children). As you slip it on your arm, you can hold your baby at an angle and keep their head slightly elevated. This way you don’t feed them laying completely flat.